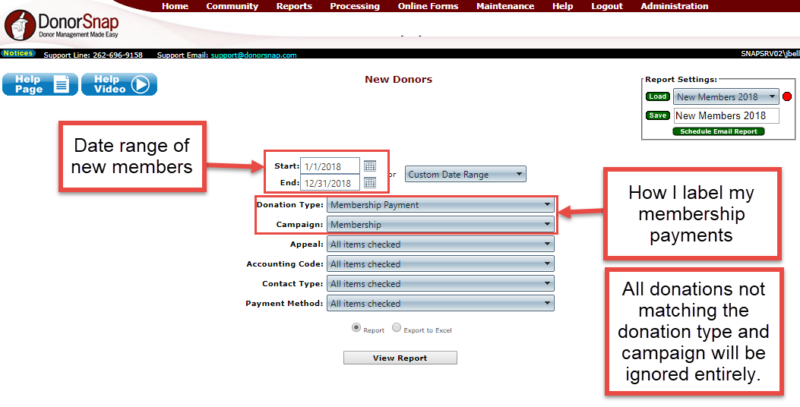 The New Donors report will pull out those that have made their FIRST donation that matches your donation criteria within the time-period provided. The Report viewer will generate to PDF and show all new donors and what their first donation was for. The Export to Excel will have the same information but additional contact information, Address, Phone, Email, etc., in spreadsheet form. The screenshot above shows selecting how this example site tracks membership donations using the Donation Type and Campaign fields (you may be tracking them differently). By selecting only the Donation Type of Membership Payments and Campaign of Membership, all other types of donations will be ignored. For example, all Capital Campaign donations will have no effect on the results of this report because they are excluded in the Campaign field. The results of this report give me John Smith who started his membership on 7/1/2018 and has never made any other donations. It also gives me Sally Jones who has donated annually to the the Capital Campaign starting in 2012, but made her first Membership donation on 1/1/2018. The Capital Campaign donations are completely ignored in this example report.